THE Census Of Agriculture…..Friend or Foe? Farmers and ranchers are notoriously private and skeptical people, especially when it involves the government. Seems like every farming family has a horror story about that one time Great-Great Grandpa’s neighbor worked with “the government” and lost the back 40. Even my own family has tales about eminent domain and “the government.” In an industry that constantly says “this is how we’ve always done it,” it can be hard to change perceptions, including a generations-long perception of the government. When the government, more specifically the Department of Agriculture (USDA), asks agriculturists for detailed information about their farms every five years, it’s not met with an enthusiastic, motivated cheer. In fact, I’ve seen many of my Aggie peers proclaim the USDA’s Census of Agriculture is dangerous or something they should not be truthful about. This attitude only serves to hurt our industry; in fact, it harms the very people it’s supposed to help. Since I broke off on my own (kinda) and lease ground from my parents, the USDA considers me a beginning farmer. My heritage pork operation enables me to finally get to be a ‘real’ rancher and have the privilege of completing the Agriculture Census! I worked very hard to get to this point in my career and did use an USDA program. I felt like it would be disingenuous of me to not talk about what I have learned and how I have benefited. Hopefully this will help clear some misconceptions and explain the many benefits the Census for you, my readers. Over the past few years, our ranch has faced some spectacular natural disasters. From severe drought, to floods, and finally fires, Northern California has “seen some things, man.” These disasters did severe damage to many farms and ranches. Even though insurance has been purchased, it often does not always make things right completely. Sometimes the USDA can offer programs and services that help farmers and ranchers recover or prevent disasters. Without the data gathered by USDA, these programs may not exist at all. Agriculture often feels under-represented in both government and culture. We often trot out the statistic that less than 2% of our population is directly involved with production agriculture. Having numbers like these, derived by the Ag Census, helps the public understand what a small segment we are and helps build trust, something we want our customers to feel. Having statistics that we can depend on helps our industry preserve itself and plan for the future. Our elected officials and commodity groups can advocate for agriculture by using these numbers to craft better policy or build facilities that we need to thrive and grow. These numbers can help fund programs like the Environmental Quality Incentives Program which can help with conservation practices. Programs like this are why I am able to have my own operation now. For ag marketers, having visible numbers for production, consumption and inventories help markets function competitively, helping farmers and ranchers hedge risk or expand markets. Having research driven data we can depend on is essential for agriculture and customers. Being informed about our worlds is the best way to understand it. 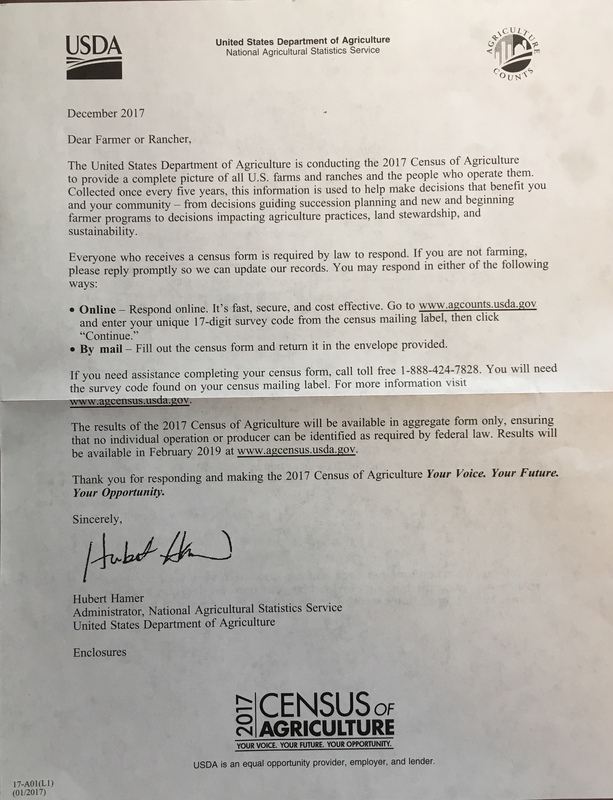 Growing up in agriculture I know firsthand the rumors spread about the Census. Farmers at the corner cafe and the Facebook groups are famous for their tall tales and skepticism. However, if you want to have your voice heard, if you want agriculture to matter, I implore you, please complete your Census truthfully and completely. We need to have information about land use and ownership, operator diversity, practices, and finances. This is information is not only imperative to change perceptions in a beneficial way about agriculture, it is necessary to keep us in business. *Special thanks to Tricia Braid for the inspiration, information and help writing this blog. She’s good people, please go follow her. And Natalie Stoppani Csf for the meme, she has a gift. I would be lying if I didn’t say that I haven’t been around meat my whole life. From even before I can remember, there I was on my dad’s back in a little carrier while he hand linked sausage all day. Or in a playpen in the deli while my mom made sandwiches. Days when I was off from school, it was a treat to go , dare I say it, “butchering” with Dad. Growing up at the locker, seeing meat being cut, sausage being made, and even the animals being butchered was an everyday thing to me. I saw it all and as far as I knew, this was normal. It wasn’t until I got a lot older that I realized not everyone ate meat or that people had such a disconnect with meat. It wasn’t until I started paying attention that I realized how many myths there really are about meat and meat production. Working at the Locker since my early teens I’ve acquired quite a bit of knowledge and always enjoy when I can share my knowledge with people. And if there is something I don’t know, I consult the boss man. My dad, David Dewey, has been in the meat industry for nearly 45 years, starting out on the slaughter truck as soon as he got his license at 16. Whether he started out liking it or not, there is no denying that meat has become his passion. And if anyone loves sharing knowledge, it is my father. So when Megan approached me to write a post, I instantly agreed. So here we are. Seeing as how Megan and her family are cattle ranchers, I figured I’d follow suit and stick with a post about beef. How much meat do you get off a beef? How many steaks do you get? Where does “insert cut of meat” come from? I am asked these questions constantly. So I took a little bit extra time while cutting beef at work today to find out this information for Megan, her customers, and readers. 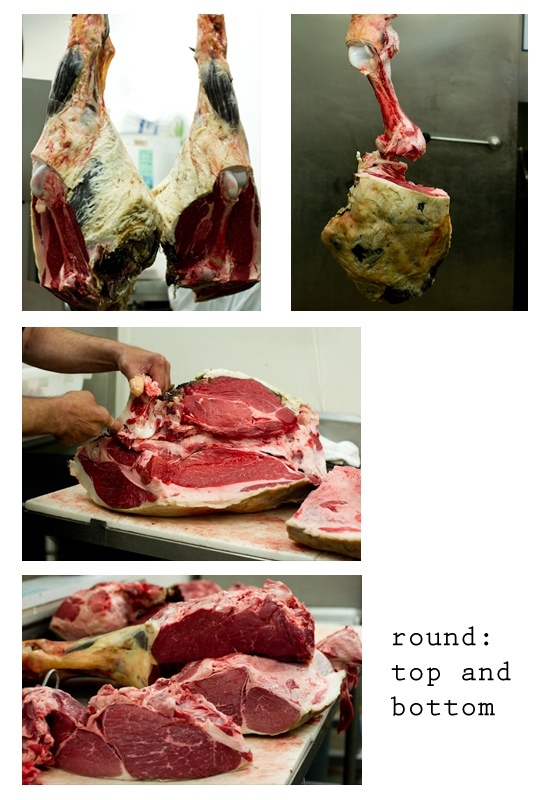 So here it is, processing of a beef from start to finish. And it just so happens that this beef pictured was butchered under federal inspection. All of the animals bought at our local fairs in the area are “harvested” by federally inspected facilities and then brought to us. Now regardless of if we harvest the animal or not, the aging process is critical. We dry age our beef for a minimum of 14 days up to 30 days depending on how large and how fat the animal is. Dry aging is described as, “when beef carcasses are stored – without protective packaging – at refrigeration temperatures for one to five weeks to allow the natural enzymatic and biochemical processes that result in improved tenderness and the development of the unique flavor,” according to an article put out by the NCBA Center for Research (http://www.beefresearch.org/CMDocs/BeefResearch/Dry%20Aging%20of%20Beef.PDF) After the dry aging process, the beef is then ready to cut. And it comes out looking like the picture above. On a whole beef, there are two front quarters and two hindquarters. 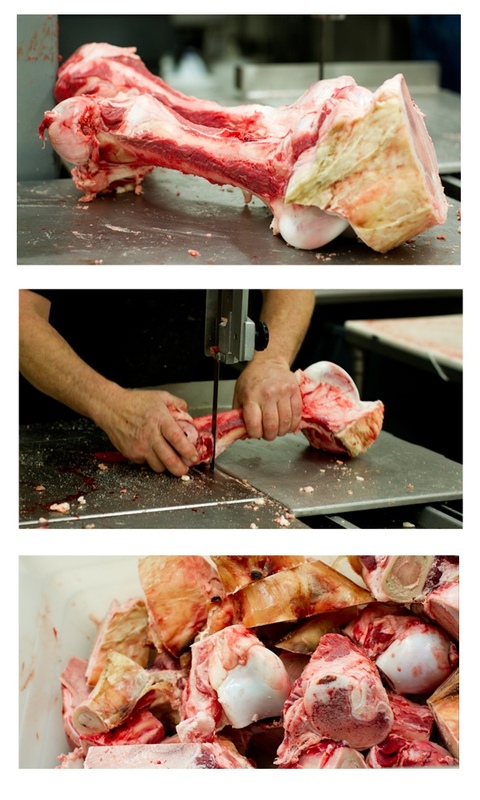 Our meat cutters (or butchers) then begin what’s called breaking the beef. This basically means that the beef is broken down into manageable pieces called primal cuts which will later be cut into steaks and other cuts. When breaking the front quarter, the foreshank or arms are removed, the brisket is removed, and the chuck is separated from the rib. 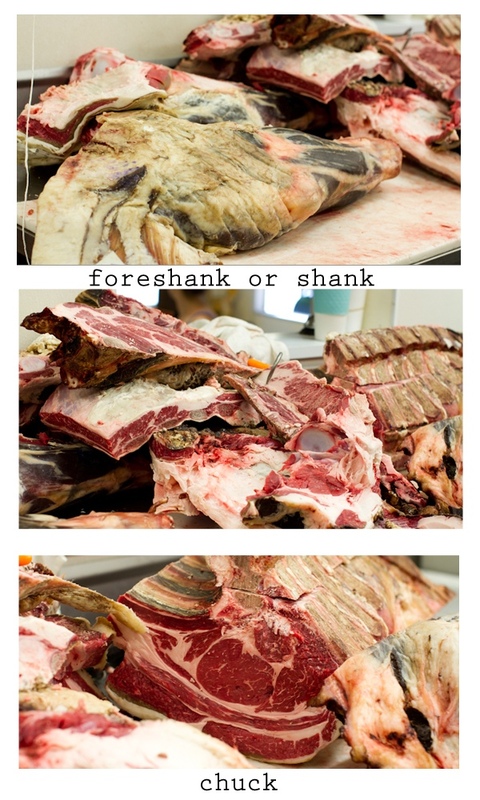 The foreshank or shank will trimmed and cut up if the customers requests soup bones, otherwise the shanks are boned. Since the meat in this area is considered tough, it will go towards ground beef and the bones will be cut up for dog bones. The next image is miscellaneous cuts that will be cleaned up, boned out, and go towards ground beef as well as six boned, rolled, and tied roasts. Mind you, that is only the first half of the front quarter, we still have the rib and plate! 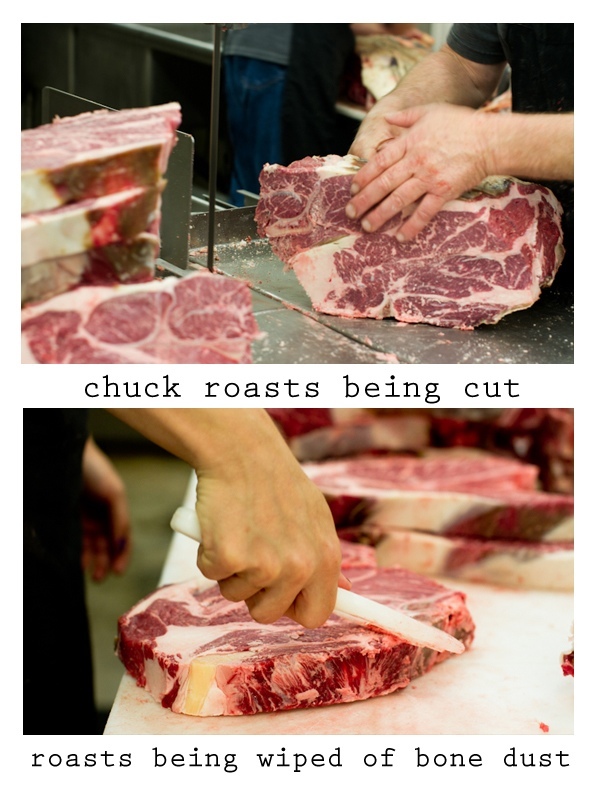 The third image is the chuck which will later be cut into chuck roasts or steaks. The brisket can be used for many purposes. Depending on what the customer orders, it can be left fresh to roast the traditional way, it can be further trimmed and used for stew meat, or we offer the option of making corned beef out of it. 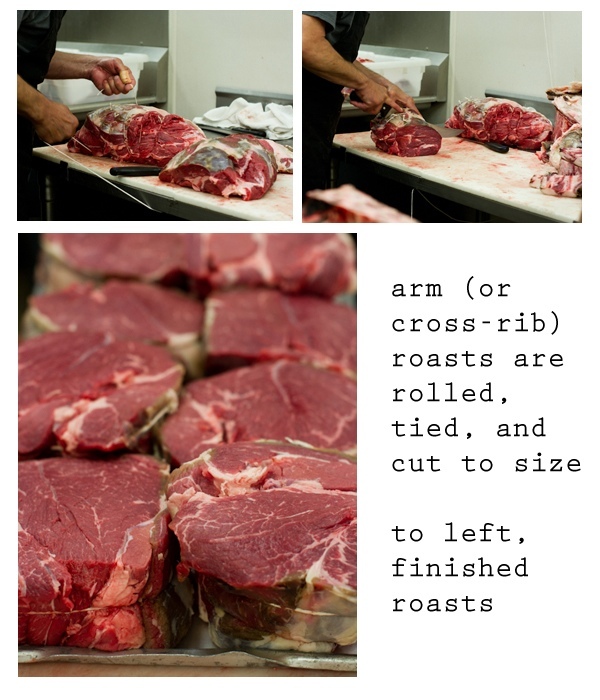 Off of an average sized beef, you can get up to twelve boned, rolled, and tied oven roasts. Six from the front quarters and six from the hindquarters. We call roasts from the front quarters arm roasts, but they can also be called cross-rib roasts. Typically this area tends to be tough so slow, moist cooking methods are recommended, like stewing or braising. This area can also be cut up for kabobs, sliced for carne asada, or something that will later be marinated. After the foreshanks, the brisket, and the chuck are removed, what is left is the rib and plate. The first image in the series shows the plate being separated from the rib. The plate is where short ribs come from. Short ribs are meaty, but also contain quite a bit of connective tissue, which is why they are best when braised. Short ribs are delicious when done right and in my opinion, completely understated. Skirt steak also comes from the plate. So those of you who love our marinated skirt steaks, here is where it comes from. We typically don’t save the skirt steak on our custom beef unless requested by the customer. During the aging process, the skirt steak takes quite a beating, requiring it to be trimmed down to sometimes near nothing. It takes a really large beef for a skirt steak to remain intact after trimming. Skirt steaks are good for stir fry like fajitas or can be marinated and just simply put on the bbq. Most cuts on the beef are pretty straight forward, it’s either/or. The rib is not one of those cuts. There are so many different options with this area sometimes it makes it hard for customers to choose. 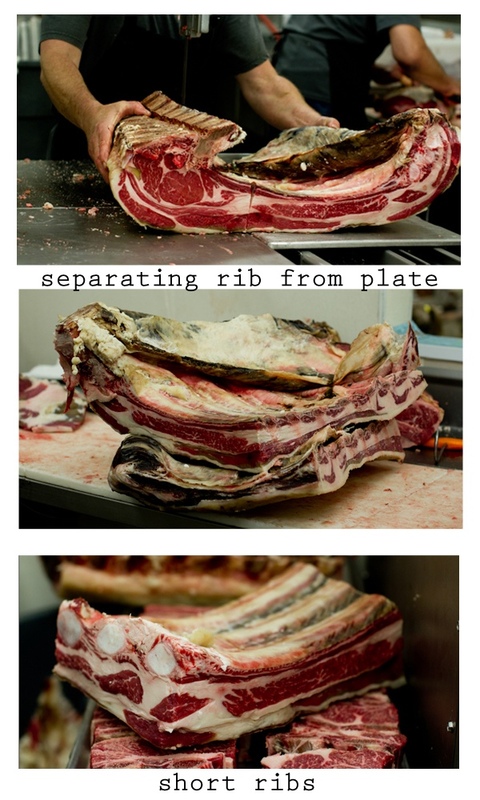 The first option is the rib can be left as a roast or cut into steaks. People always ask me, well, which is better? And my answer to that is, either. It depends on personal preference. If you like to take the time to cook a roast than go with the roast or if you don’t like to spend the time cooking and just want to throw it on the bbq then go with steaks. And this principle applies to the whole beef, just because a cut sounds good, it may just sit in the freezer for half of the year unused. Knowing your cooking style and what you like to cook is important when having a beef processed. It can be quite a costly investment so we want our customers to be able to enjoy all of the cuts ordered. If you are a repeat customer of ours and it’s that time again to give your cutting order, tell us what cuts worked for you and what didn’t. Ask us, is there anything else we can do with that area, I didn’t really use it. Anyways, back to the rib, both choices (roast or steaks) can be ordered bone-in or boneless. Steaks with the bone left in are called rib steaks and boneless steaks are called ribeyes. Roasts with the bone left on are called standing prime rib roasts and roasts that are boned are called ribeye roasts. If either the roast or steaks are boned out, those ribs are trimmed up and called beef back ribs (or bbq ribs) which is the exact same cut as the baby back ribs on a hog. Well that is pretty much all you get out of the front quarters, any cuts not covered here are boned out, trimmed up, and used for hamburger. Phew, are you overwhelmed yet!? Here we go, onto the hindquarters.. 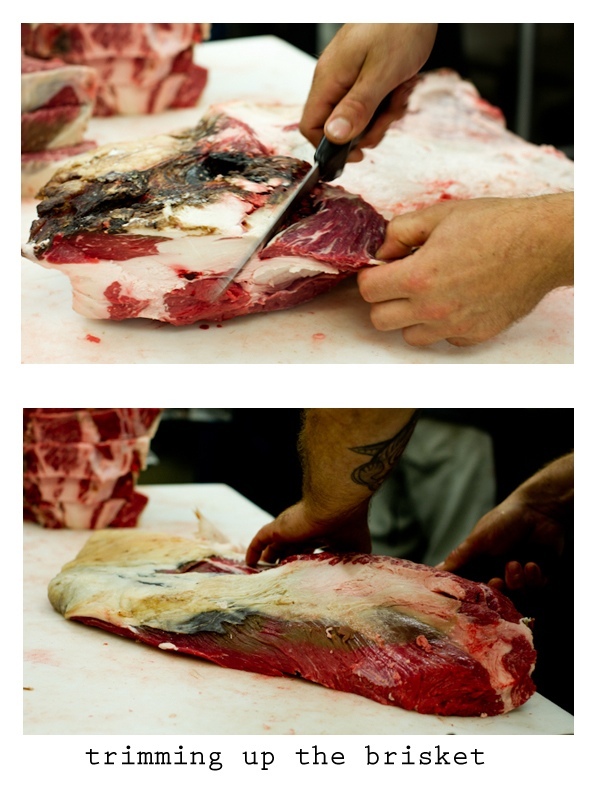 The first step in breaking the hind quarter of a beef is to remove the flank which will be trimmed up for flank steak. Flank steak is considerably less tender than the more desirable cuts of the loin, but marinated or braised, flank steak can be very tender and flavorful. Next the tri-tip is pulled and anyone reading this from California hands down knows what tri-tip is and how to prepare it. But much to our Californian disbelief, our love affair with the tri-tip is not shared with the rest of the country. So for those of you who don’t know what a tri-tip is, here you go. A tri-tip is a small triangular muscle which is normally pulled off a carcass of beef on the primal cut, bottom sirloin. Marinate it, throw it on the BBQ, and you will find out why tri-tips continue to increase in popularity throughout the West coast. Also coming from the hindquarters and the next cut of the breaking process is removing the sirloin tip. Unlike it’s name, the sirloin tip doesn’t actually come from the primal cut known as the sirloin, it comes from the round portion of the hindquarter. It is also known as a round tip steak. These steaks are good for marinating and throwing it on the bbq, braising, or using for stew meat. The loin is pretty straight forward unlike the rib portion of the beef. The loin portion of the beef is broken up into three subprimal cuts: the short loin, the sirloin, and the tenderloin. The short loin is where tee bone steaks, porterhouse steaks and new york steaks come from. If you cut the short loin bone-in than you will get tee bone steaks and porterhouses. If you cut the short loin boneless that’s where new york steaks come from and the tenderloin will be pulled as a whole piece and cut up into filet steaks. 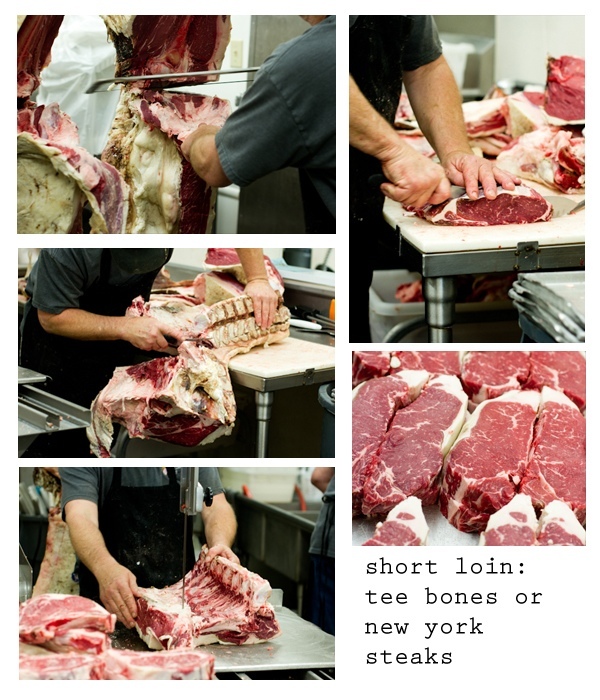 In the bone-in option, part of the tenderloin, still attached to the bone, is cut up and is also what differentiates tee bone steaks and porterhouse steaks. 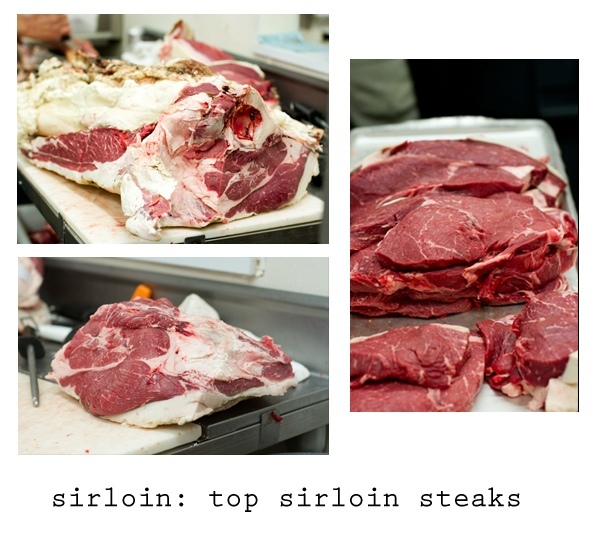 In the photos you can see the short loin is removed from the round and the sirloin is also removed, leaving just the short loin. 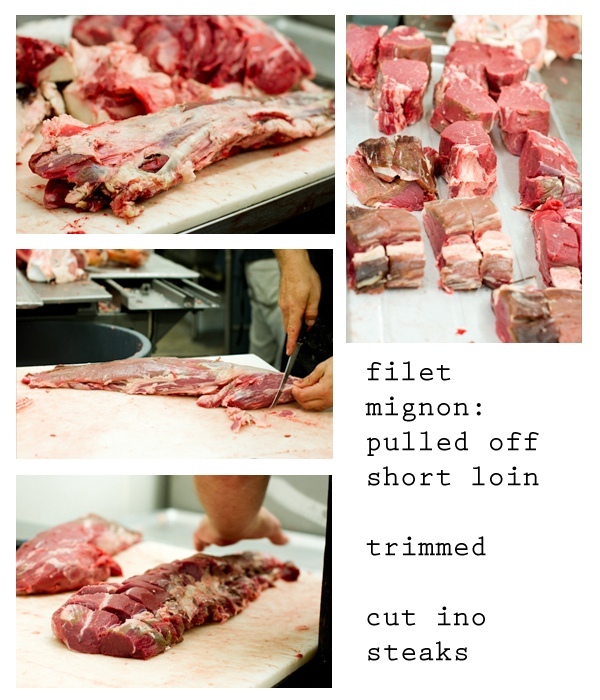 In this example, the tenderloin is removed and the short loin is boned out and cut up into new york steaks. The sirloin is also pretty straight forward being made up of only two cuts: the top sirloin and the bottom sirloin. The top sirloin is cut up into steaks and serves as a lower quality, more affordable steak but can have the same great flavor as a new york or tee bone steak. 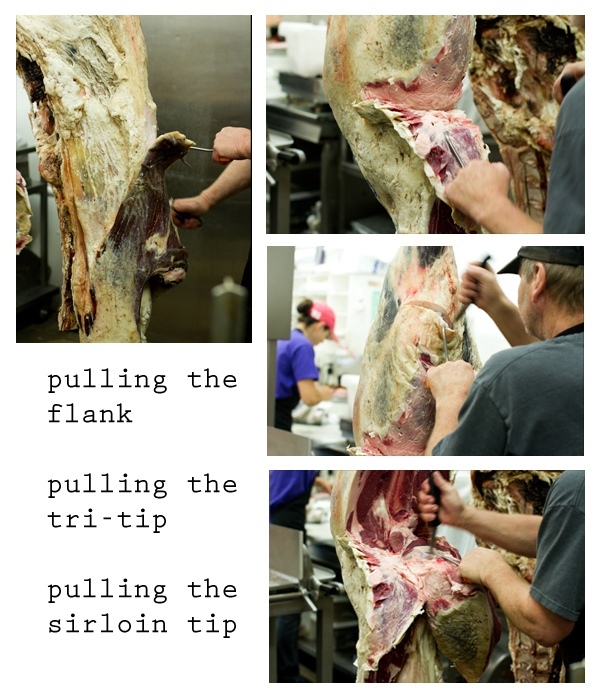 The bottom sirloin usually contains the tri-tip in the traditional breaking, however, we break our beef a little differently than the traditional way, we pull the tri-tip off the bottom sirloin as one of the first steps in breaking a hindquarter. After the loin is removed from the hindquarter all that is left is the round and the shank. The round is removed from the shank and then broken up into what is known as the top round and bottom round. If the shank is partially boned and trimmed and the round is left on the leg, this is what is known as a steamship round. This is basically a leg of beef weighing in around 50 lbs. which can be cooked for large parties, etc. If the customer does not want a London broil, the top round is then cut into steaks called top round steaks. A London broil is essentially a thick cut (think 2”) top round steak. The bottom round is also cut into steaks leaving a small piece which will be rolled and tied into a roast known as a rump roast. All cuts coming from the round require a slow-moist cooking method like braising in order to increase tenderness in the meat. 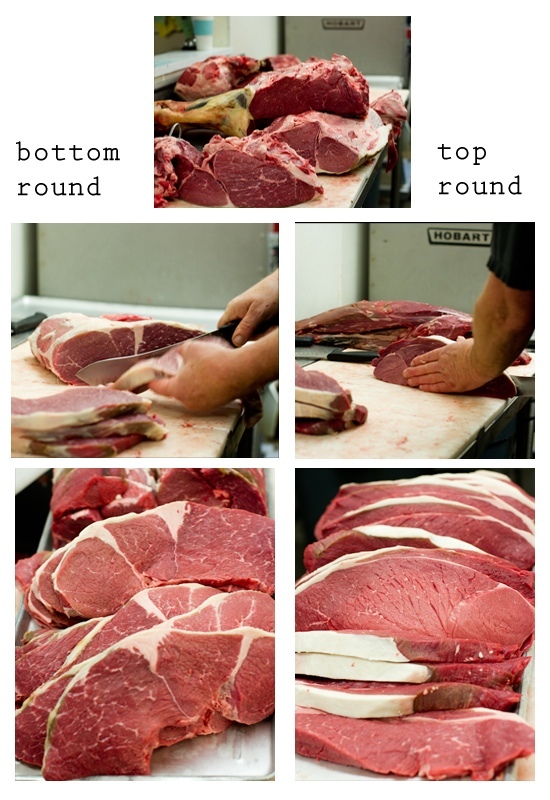 The top and/or bottom round steaks can also be cut into halves or thirds (depending on the size) and tenderized. These steaks make great chicken fried steak, etc. Other uses for the round include jerky, carne asada, pastrami, or corned beef. Now what do we have left? Well all those cuts of meat were trimmed up in order to cut steaks, so all that is remaining is the trimmings and this is where ground beef comes from. With that said, anything on the beef can be cut up and ground. Say for instance, you don’t want the chuck roasts or round portion, we can add that to your ground. And for consumer information, most ground beef you buy in the store is not made up of purely trimmings. Our ground beef sold in our shop is made up of ground chuck. The trimmings and whatever other cuts the customer wanted to grind is thrown in the grinder, ran through a hamburger plate (about 3/16”), thrown back in the grinder, and run through again. 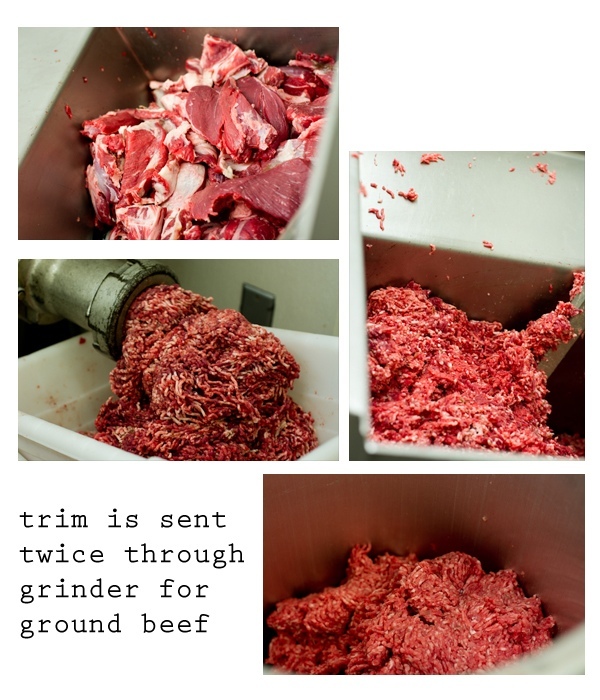 The reason for grinding the meat twice is to achieve a finer grind as well as a more blended product. As you can see from the photos, after the first grind, fat and muscle are clearly seen whereas the final photo actually looks like ground beef where fat and muscle are blended. The ground beef is then portion stuffed into tubes based on what size the customer wants (typically 1 lb.) and the tubes are stapled shut. All that is left is the bones. Femur bones and front shank bones are usually cut up for dog bones and given to the customer if requested. Now it’s down to the nitty gritty, the numbers. We charge our customers on the hot carcass weight. This means that once the beef is rolled off the truck, same day it was slaughtered, we weight it and tag it. The weight on the tag is what we charge our customers and this is fairly standard in the industry. Customers are sometimes confused by their bills when the weight says, 775 lbs. and they received 8 boxes of meat averaging around 50 lbs. Depending on how you have your beef cut, it will not weigh the same as it did when it was hanging. As I have shown you, a tremendous amount of trimming and boning will take place resulting in a much lower net weight. Hot Carcass Weight: 775 lbs. Net Weight of Meat (bones not included): 457.85 lbs. So taking the net weight divided by the hot carcass weight we can see that gives us 60%, which is standard. Usually you net about 52-60% finished meat off of a whole beef. If this customer would have chosen more cuts bone-in, that percentage would go up and if this customer wanted more cuts to be boneless, that percentage may drop into the high 50 percent range. So when you are buying carcass beef from someone, be sure to do the math and figure out what you are really getting for your money and realize that the carcass weight you are paying for does not equal weight of meat coming back to you. Well, there it is. 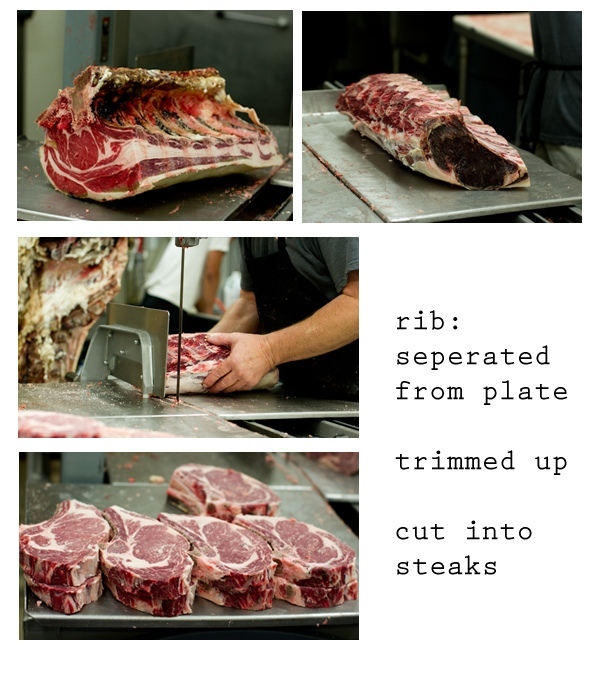 A cutting of a beef from start to finish. I hope I was able to clearly explain the process to you all and hopefully you go away from this being more informed about beef and beef cuts. Thank you so much to Megan for this opportunity and hopefully you will hear from me again soon! Please feel free to e-mail me (dancincow16@hotmail.com) or Megan with any questions regarding the post. 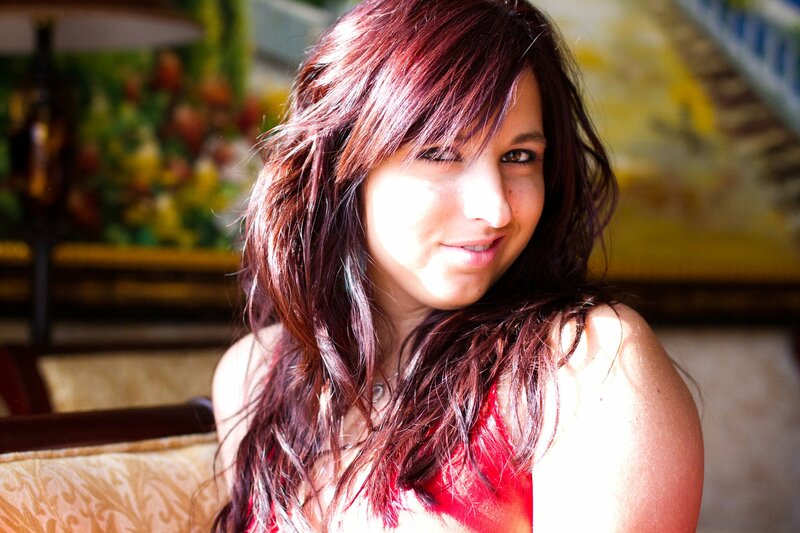 Jenny Dewey is a graduate from the Arts Department at Chico State. She currently works full time along side her father, mother, and brother at Chico Locker & Sausage Co. Inc as well as working part time for [ j. l. d. ] Photography, her business as a lifestyle photographer.